Happy New Year to all of you. See you on Monday January 5, 2009. 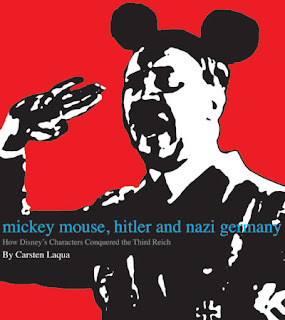 I caught myself jumping up and down yesterday after having received an email from David Peake who spotted the book Mickey Mouse, Hitler, and Nazi Germany: How Disney's Characters Conquered the Third Reich by Casten Laqua on Amazon. I have had Carsten's book (originally titled Wie Micky unter die Nazi Fiel and originally released in 1992) in my library for the last 15 years, but since it is written in German I could only look at the great illustations and try to guess at the content. 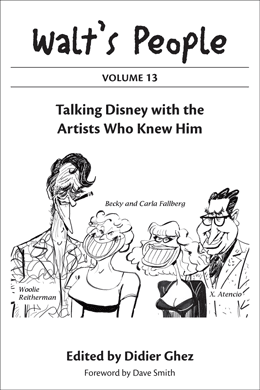 What made this even more frustrating is that I have known Carsten personally for years and since he is a great Disney connaisseur (who interviewed quite a few Disney artists in the past) his book about Disney in Germany in the '30s was bound to be fascinating. Which explains why I can't wait to finally get ahold of this English translation. 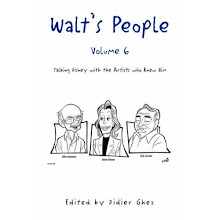 What made David's email even better is that by checking the site of the publisher, Hermes Press, I also discovered that Thomas Andrae is about to release most of his in-depth interviews with comic-book artists in a single volume titled Creators of Humor in Comic Books. 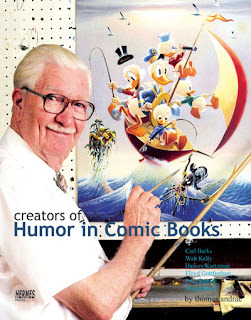 Since we have already read his interview with Barks in Carl Barks: Conversations, the main justification for my buying this upcoming book will be his Gottfredson interview, although I am also bound to enjoy the one with Walt Kelly. 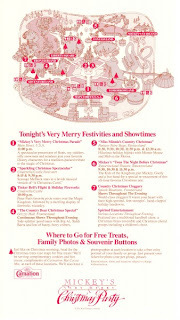 [Here are some scans from a Mickey's Very Merry Christmas Party Pamphlet from 1993. 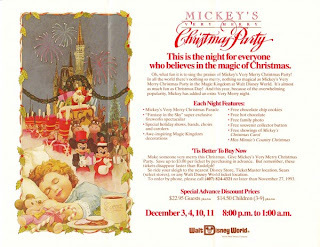 This is quite different for Mickey's Very Merry Christmas Party 15 years later that just finished celebrating! There was then this map for the event which is almost like a very large postcard. Here is the front. I dont know if you have seen this material yet or not - but I dont recall seeing it on your blog - so I thought I would email you to let you know about it. I have recently come across a small online archive at the Oviatt Library digital web site. 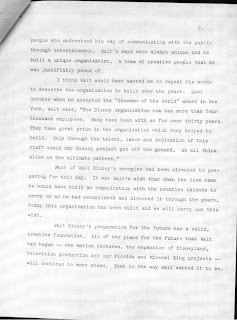 It seems that they have some original scans of a pre strike memo from Walt along with a bunch of other strike related material donated by Jim Charmichael. 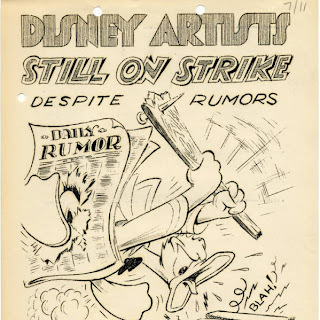 There is also some strike related cartoons, a few strike newsletters, and so on. If you go to the Oviatt library site and do a search on Disney they will all pop up. I thought they would make a nice addition to your blog. Pete Emslie just sent me today a link to his great post Have An Ollie Jolly Christmas! Merry Xmas to you all. The blog will be updated again on Monday. Someone I will call for now "a powerful friend" is looking to acquire high resolution scans of rare photos of the Hyperion Studio (especially of life and work at the Studio). That same friend is also trying to locate recordings of artists discussing their work on Snow White. If I have not yet contacted you yesterday by email about this very subject, could you drop me a line. For those of you that I already contacted yesterday about this, I should have some updates in about 10 days. That said: Merry Xmas and Happy Hanukkah to you all. [I recently found this short press item from the Los Angeles Times, May 11, 1941. They didn't get much for the old studio compared to what they had to pay for the new one in Burbank. 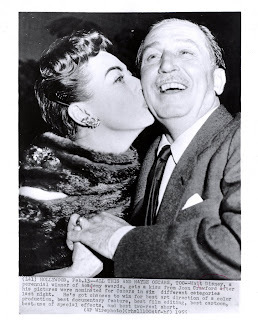 Three great photos of Walt being sold on ebay today. 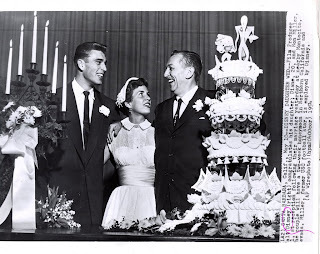 I particularly love the one that shows Ron, Diane and Walt at Diane and Ron's wedding as it finally gives me the opportunity to see the often discussed cake with its unusual top decoration. [Toys for Tots began in 1947. 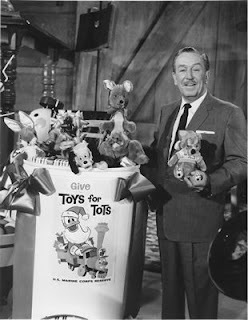 Walt Disney became involved the very next year by having the studio design the Toys for Tots train logo that is still used to this day. Why a train for the logo? 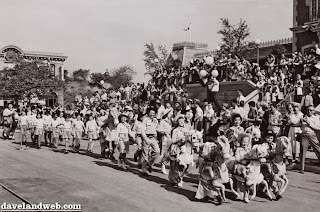 Well, perhaps it had something to do with the fact that Walt had just returned from the Chicago Train Fair that summer and was already thinking about building a miniature railroad at his home. Walt was also responsible for the first poster ever created for the campaign in 1956. It featured Donald Duck dressed as Santa Claus driving the Toys for Tots logo train. 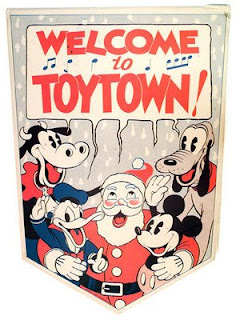 Over the years, Mickey Mouse, Dennis the Menace, Bugs Bunny and Captain America have been on various Toys for Tots posters. Walt became involved with the group when he was contacted by the then Director of Public Relations for Warner Brothers Studio, Major Bill Hendricks who was part of the Los Angeles Marine Reservists. In 1947, Hendricks’ wife Diane had made a Raggedy Ann doll and asked her husband to give it to an organization that helped needy children at Christmas. Hendricks discovered no such agency existed so he started his own with the help of fellow Marines who collected and distributed new and used toys. The Marines used to refurbish the used toys on Reserve drill weekends but since 1980 have only collected new toys. Kelvin Bailey, a reserve Marine officer and one of the Disney Studios pilots for the company plane, bumped into Walt in a hallway in 1965 and told him that even though the program had been around for seventeen years, it could benefit from a little Walt Christmas magic. Bailey was also the public relations man for the project. 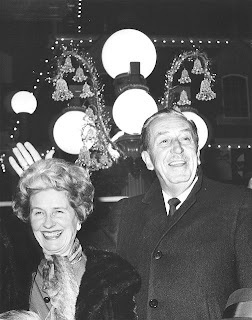 Walt ‘s active participation in 1965 resulted in over a million children receiving Christmas presents who would not have had a visit from Santa that year. 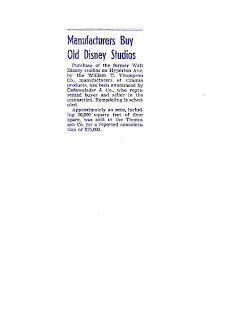 It was an increase of seventy percent over the previous year so in 1966, Walt was once again requested to make a television pitch. 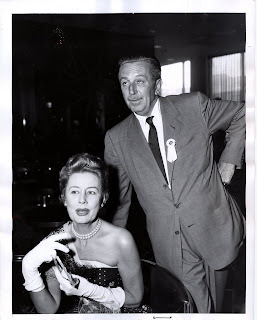 Walt not only did so but drafted the Disneyland characters and actress Greer Garson, who was filming “The Happiest Millionaire” on the lot, to make appeals. “Yes, Dad was really was dedicated to Toys for Tots. 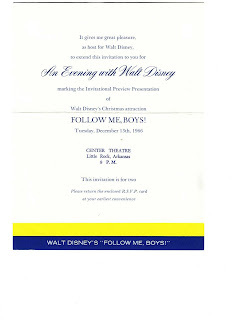 You might find in archives a photo of Chris, our oldest child, accepting an award on his grandpa's behalf the year after he died,” Diane Disney Miller, Walt’s daughter, wrote to me recently. 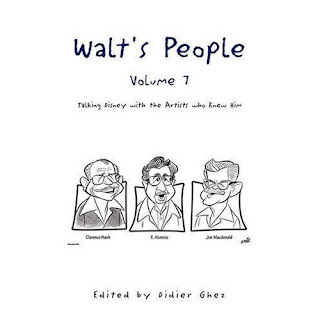 Walt was very quiet and modest about his charity work which was quite extensive from his support for the John Tracy Clinic, a facility for deaf children and their families, to the children’s wards at St. Joseph Hospital decorated by Disney artists to countless other unsung acts of generosity. [Most of us have assumed that this current “wave” of Disney Treasures DVDs will be the last. After all, the first five waves of Treasures were issued in quantities of 125,000 tins per title. Last year, Wave 7, the release was dropped to only 50,000 tins although the Oswald title had 120,000 tins produced. This year, Wave 8, the three releases were only issued in quantities of 39,500 tins each and even prominent sellers like Amazon are already out of copies before Christmas. However, Disney Movie Rewards members (an official Disney DVD club) recently received in the mail a Zorro lithograph with a flyer that says “Coming soon to DVD as part of the Walt Disney Treasures”. Colorized versions of Disney’s Zorro episodes have already been released to Disney Movie Rewards members but the black and white versions including the hour long episodes and the movies compiled from the half hour episodes have never been released on DVD. [I’ve gotten some feedback with folks wanting to know more about “Christmas Bowl” at Disneyland that preceded the better known “Candlelight Processional”. Here is a photo from Christmas 1956 where you can see what that first Christmas musical celebration looked like. Have you ever wondered what each of the Disneyland attractions looked like year after year in the Park and how the park itself evolved? Then you really should discover Daveland if you have not already known it for years. I just spent time exploring it this week and was amazed at the wealth of photographs and information it contains. 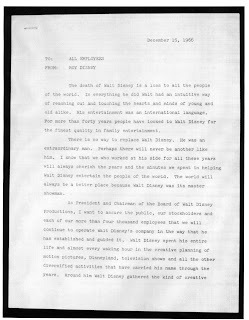 Jim Korkis sent me this memo from Roy issued just after Walt's passing on December 15, 1966. I should have posted it two days ago, of course. [Another great website that I keep forgetting to mention is http://coa.inducks.org. 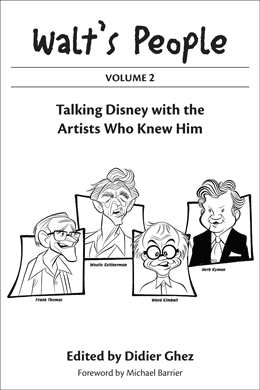 It lists to the best of everybody’s knowledge the writers and artists of Disney comic books. You can search by character or artist or by specific title. I use it to find information on some of the live action movie adaptation comic books although I was also able to use the site to find out that it was artist Tony Strobl who did the artwork on the giveaway comic book that featured the Florida Orange Bird. 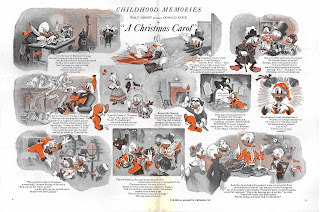 The site also includes foreign Disney comic books so I was able to find that the Disney Christmas comic strips that appeared each December in newspapers for many years were reprinted in color in foreign Disney comic books! 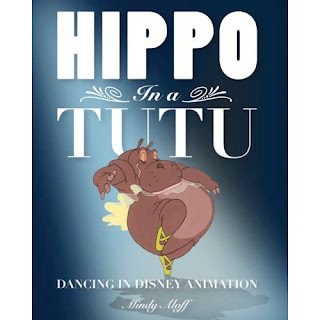 One of the books I was really looking forward to buying before interviewing its author was Hippo in a Tutu: Dancing in Disney Animation by Mindy Aloff. Having been contacted by Alexander Rannie, who helped research the book, I knew that both Mindy and him were doing their homework and were doing it well. After having interviewed Mindy my position has evolved: I am no longer looking forward to it, I would litterally like to be able to project myself to February with a time machine to be able to get that book... now. I have a feeling you will enjoy this interview no end. DG: When, why and how did you decide to tackle this project? Mindy Aloff: Long before I was tapped, about six years ago, by Disney Editions to write Hippo in a Tutu, the concept for it had been germinating in the mind of the choreographer Christopher Caines, then an editor at DE. The title is his. 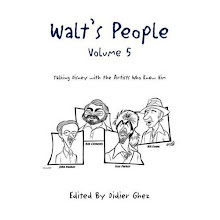 He had worked on many Disney books—intensively, for example, on the biography of Ubbe Iwerks, by Ubbe’s daughter—and he couldn’t understand why a studio that had relied so often on dancing in its animated films didn’t already have a book on the subject. Christopher brought the idea to DE’s editorial director, Wendy Lefkon, and the process to realize it was put into drive. 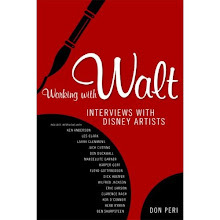 My life-experience bona fides are detailed in the book’s introduction, where I write about the importance of Disney films to me during my childhood and, again, during my daughter’s childhood, when she and I would watch the films together. Also, I had written on dance and animation in the early 1990s. The first time was for the late Burt Supree at The Village Voice, who sent me to a Warner Bros. animation retrospective of 100 historic shorts, expecting a love letter to Carl Stalling et al, and who got a story with a lot of complaints about how Warner’s treated dance in its cartoons and a statement of preference for the Disney perspective (the story never saw the light of day). 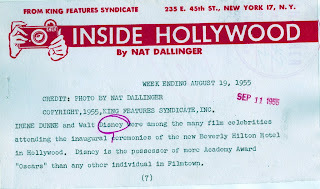 The second writing was for the “Dance” column I filed weekly, without byline, in the “Goings on about Town” department at The New Yorker for several years, where I compared the animated films of Warner’s and Disney by way of their treatments of dancing. I put my heart into that tiny essay. Only a handful of people noticed it, but those few included the late New Yorker theater critic Edith Oliver. Edith was a little daunting, and I always remained at a respectful distance. One day, though, shortly after my animation column was published, she stopped me in the hall to say that she thought my animation story was the best piece of writing in the magazine that week. She gave me the moxie to believe I had something to say. It was an amazing, fantastical experience to research this book. And I do seem to have enough material for another volume, which I hope eventually to share through lectures and additional essays. DG: What is your focus? Can you give us an idea of the book's content? MA: Wendy and Christopher gave me all the freedom I needed—and wanted—but they did determine the scope of the book in advance. They also asked for sidebars, deep captions, and so forth, to relieve the eye; and they were concerned that Fantasia—for most Disney fans the greatest example of animated dancing that the studio ever produced—should be discussed, not merely mentioned. Christopher provided, in detail, a working hypothesis about the place of dance in Disney animation, which I then considerably developed and qualified in the course of the writing. And I was asked to consider the broadest possible audience: fans of dance, of animation in general, and of Disney, in particular, as well as bright high-school students. A lot of structure in the format, yet I was thrilled: I didn’t have to write a scholarly text, a chronological history, but could be freewheeling, writing each chapter as an essay. And there was no censorship: I could report what I found and say what I thought about it (not always my experience as a writer). In terms of a model for the freewheeling part, I went back to Lulu in Hollywood, the collection of essays by Louise Brooks; to a little volume called On Beauty and Being Just, a diptych of essays by Elaine Scarry; and to Joseph Mitchell’s collection of profiles and features on New York waterways, The Bottom of the Harbor. None of them has the least connection to animation, dancing, or Disney; I just enjoy them, and it seemed important to my own project to remind myself why. In terms of the visual presentation, I went back to my experience as the editor of the Vassar Quarterly, where I had the same kind of editorial freedom and the same mandate to make the publication visually engaging. So I began to think of the book as really two books: a reader’s book, for the people who will have the leisure to sit down with it, and a browser’s book, for most of the people who will pick it up. I tried to make the browser material long and the essays short. And I tried to balance the celebrated and the obscure, accenting the films that would bring several generations together—Fantasia, Snow White and the Seven Dwarfs, The Jungle Book—as well as some of the spectacular animated shorts that are rarely discussed and features and featurettes, such as “The Legend of Sleepy Hollow” from The Adventures of Ichabod and Mr. Toad and The Hunchback of Notre Dame, that are often overlooked. As for the subjects of the chapters, I chose to concentrate on fundamental questions: What is the distinction between dancing and choreography? How does music relate to dancing? Who were the live dancers who served as references for some of the animated characters and how did the process of incorporating their contributions to the films actually work? One thing I noticed after Jon Glick designed the layouts was that the look of the spreads evoked the way the Internet looks. I like that very much: it permits such freedom and flexibility; and I’m beginning to see that look in other books on completely unrelated subjects, for example, a heartbreaking work of the highest scholarship, which I recently taught at Barnard, called Hidden Letters, a collection of letters by, and supplementary contextual material that concerns, a Jewish teenager from Holland named Flip Slier, who died in the Holocaust. My book is not as scholarly as Hidden Letters, but it does contain source notes—many of them explanatory or otherwise amplifying—as well as an extensive bibliography, an index, and two dense pages of acknowledgements that try to spell out what the people who helped on this project actually contributed. DG: How many illustrations will it contain and what type of illustrations will it contain? MA: A lot! They are quite wide-ranging, too: some frames from the animated films, many preparatory drawings, a musical manuscript, page one of a little newspaper to publicize one of the shorts, a page of choreography for a 17th-century horse ballet, photographs of character models, photographs of personages and of stage choreography. There are also frames from a couple of live-action reference films that are not archived on commercial DVD. DG: What will be the main chapters of the book? DG: What discoveries did you make while researching this book? MA: Everything was a discovery. 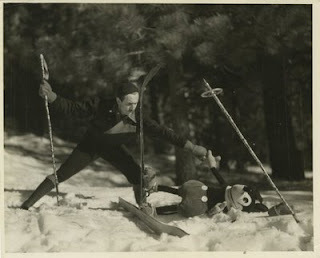 For example, the extent of Marge Champion’s involvement in the gestation of Fantasia’s “Dance of the Hours”; the fact that George Balanchine kept in touch with the animator Bill Tytla following Balanchine and Stravinsky’s visit to the Disney studio; the adorable dancing of The Jackson Brothers, who served as the live-action references for all the crows in Dumbo; the fact that Arturo Toscanini, E.M. Forster, Lincoln Kirstein, Edwin Denby, and many other intellectuals in the U.S. and Britain considered Disney to be a cutting-edge artist; the fact that the de Basil ballerina Irina Baronova, choreographing herself, served as the live-action reference for the ballerina ostrich in the “Dance of the Hours.” Perhaps the most important discovery for me is represented on page 41: the list of Disney character shorts, Silly Symphonies, and features between 1928 and 2002 that contain significant episodes of dancing: 68 entries! With one or two exceptions, this list had been compiled years ago by the staff overseen by Dave Smith in the Burbank Archives. The fact that they thought it important to make that catalogue was extremely heartening. Dance is often kicked away by other arts as a decoration or something not worth the effort to preserve. 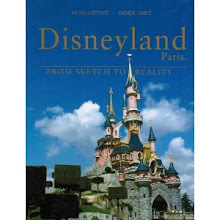 DG: What do you believe will be the most exciting parts of the book for Disney history enthusiasts? MA: Seeing the art, probably, some of which has never been published. And perhaps reading about the dancers who served as the live-action reference models. Also, working on opposite coasts, Alexander Rannie and I have put together what may be the first detailed biography of the African American actress-singer-comedienne Hattie Noel, who served as one of the references for Hyacinth Hippo. DG: What was the role of Alexander Rannie in this project and how did he get involved? MA: Alex helped me in myriad ways. 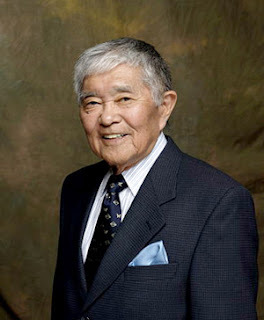 He tutored me in how the musical dimension of the animated films worked in a technical sense, and he served as a living encyclopedia of information about the animators, composers, storymen, and art. 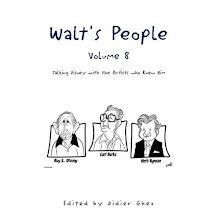 He introduced me, online, to the composer and historian of animation music Ross Care, whom I interviewed by telephone; arranged for me to conduct a telephone interview with Burny Mattinson; and kindly served as a liaison for me with several collectors of Disney art, who generously provided images of the works from their holdings. Alex pointed me toward some rare books I wouldn’t have been able to find on my own. 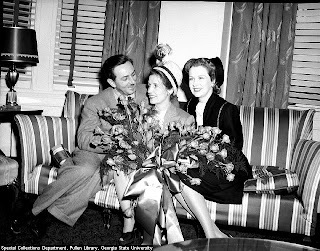 As a frequent researcher at the Disney studio and a consultant to The Walt Disney Family Museum, he was able, as well, to discover some images about whose existence I would have otherwise had no idea. When I felt the need to discover something about what happened to Hattie Noel after the 1950s, Alex kindly drove around Los Angeles to discover the relevant material. He fact-checked the book! As both a creative and an interpretive artist, a composer and a former pianist for dancers, Alex served as a sounding board for ideas and also—through sharing his own brilliant ideas—as an inspiration to think more deeply. Any idea of his that I used has been attributed to him in the text, and in places I have quoted him directly, with a source note in the back. But the most exciting part of our entirely 21st-century friendship—I have never met him in person—were the conversations over the phone and through E-mail about the reading and the films and ballet and theater. They reminded me of a time, many years ago, when I was in constant contact with other writers who were excited about the same things I was and who had the same background. Why did Alex offer to do all this? I can’t say, except that he’s a mensch of a very high order and has racked up a lifetime’s worth of mitzvahs for his efforts. But other animation historians have been generous beyond description as well: John Canemaker, for example—a celebrated working artist as well as a distinguished historian—is a mentor who could be Mentor, himself; I feel privileged to be one of his hundreds, perhaps thousands, of adoring students. 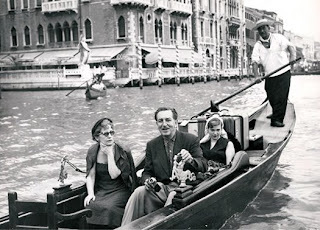 At Disney, itself, Jeff Kurtti was an extraordinary guide, and the hospitality that he and his family offered on one of the trips made it possible for me to study at the Photo Library, period. At the main Archives, Dave Smith, Becky Cline, and Robert Tieman were tremendous resources, as, at the ARL, were Lella Smith, Fox Carney, and Ann Hansen, and, at the Photo Library, was Ed Squair. I think they realized that, although I didn’t know much about their field to start with, I truly tried to learn, and I truly love the films. From my own field of dancing, too, the choreographer Mark Morris took time from making new work and many other stresses to contribute an illuminating statement about how much Disney has meant to his own imagination. Their collegiality made this project one of the high points of my life. Nevertheless, the writing and the concepts you’ll find in the essays are entirely my own, and I take full responsibility for inaccuracies or flaws of logic or reporting. These wonderful colleagues brought many of the groceries to the kitchen, but I cooked the meal. DG: Are you considering tackling any other Disney-related books in the future? MA: Wouldn’t it be lovely? Well, if the opportunity for another project were to present itself, I’d certainly be delighted. I suspect, though, that I’m standing at the end of a long line. 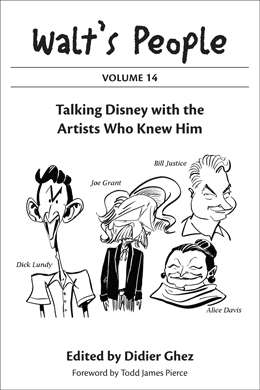 There are a host of outstanding animation historians who know much, much more about the Disney enterprise than I could ever hope to master. This is their field, into which I’ve been invited as a cosseted guest. I’ve never forgotten that. Great Mary Balir concept art currently being sold by Van Eaton Galleries. The Disney Books Network was finally updated this weekend. 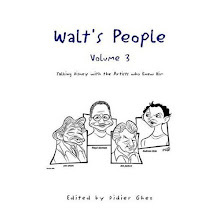 I was browsing on Amazon today and just spotted an exciting book to be released next year by University of Mississippi Press: the autobiography of former Disney-artist and Scooby-Doo creator, Iwao Takamoto (see one of the past volumes of Walt's People for an interview with him). Iwao Takamoto: My Life with a Thousand Characters will be released in March 2009. Can't wait. Walt had been admitted at Saint Joseph's Hospital and passed away on December 15, 1966. 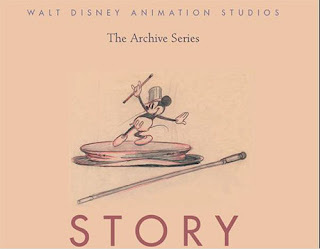 Since the long awaited Walt Disney Animation Studios The Archive Series: Story has just been released this week, I took the opportunity to interview the head of Disney's Animation Research Library to understand how this book came into being and the future of the series. I found Lella's last answer particularly exciting. Didier Ghez: How did you get involved with this project? 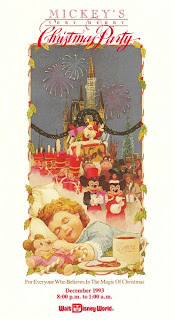 Lella Smith: The ARL often provides images for book projects for clients throughout the Disney Company. 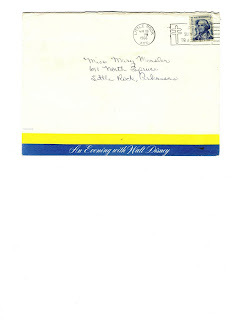 (The library is the repository for about 60 million pieces of animation artwork at the Walt Disney Company.) 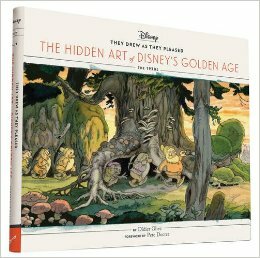 We have wanted to do a book about the collections of the Disney Animation Research Library for some time and now we have the opportunity. 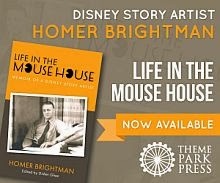 We are grateful that John Lasseter and Disney Publishing are giving us this opportunity. DG: What were your criteria to select the artwork? LS: We wanted great images that would inspire artists and intrigue non-artists. It was quite a challenge reducing the amount of artwork to fit the size of the book (approx. 275 pages). We had to make some hard choices and we are proud of the final selection. DG: What were the most surprising discoveries that you made while selecting the artwork? LS: According to Fox Carney, our lead researcher, here are his answers to that question: “We discovered the numerous styles of drawings that each epitomized the styles of the eras in which they were drawn. We studied the detailed pencil renderings of the early era of animation in the 1920's & 1930s. We marveled at Bill Peet's elementary yet evocative drawings that capture the stylings of the 1940s & 1950s. 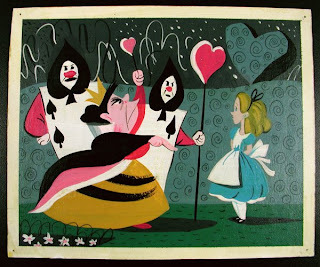 Every artistic period seemed to be on display through the decades as we researched the history of Disney animated films. We learned how some animators lent their creative talents not just to character animation but engaged their artistry in telling the larger story. Marc Davis' story sketches capture the idealistic joie de vive of Bambi's youth. 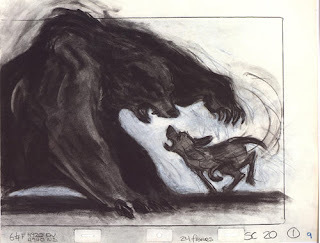 Glen Keane's powerful experimentation with charcoals and mixed media explode with the ferocity of the bear fight from The Fox and the Hound. 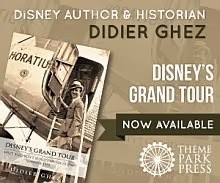 DG: For true Disney historians, what will be the highlights of the book? LS: We searched our vaults for many hours on our own and we also met with John Lasseter and his Story Trust to find out about their favorite story moments. It was really interesting how many times that same works were mentioned. The Dumbo images from the Roustabout scene are fantastic. Many of these monochromatic pastels were drawn rather quickly on construction paper but they are dynamic and they evoke the mood of the film beautifully. Susie the Little Blue Coupe is another favorite because of the period style and humor. DG: The title of the book strongly suggests that it is the first in a series. Could you tell us a bit more about the future of that series? LS: When John Lasseter became the Chief Creative Officer, Walt Disney & Pixar Animation Studios, he thought of the idea of creating an Archive Series that would feature artwork one animation element at a time: Story, Animation, Design and Background/layouts. We also want to produce smaller , supplemental books that focus on individuals, special sequences, etc. 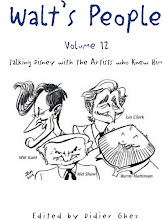 Our first book for this would highlight the artwork by the great story artist, Bill Peet. 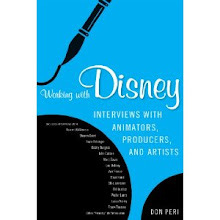 If you are an animator the upcoming book I just spotted on Amazon will probably excite you no end. 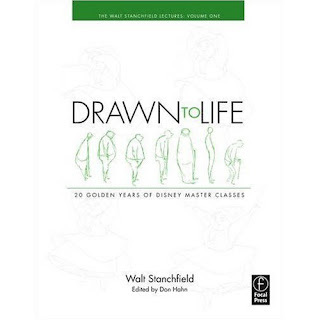 I am talking about Drawn to Life: 20 Golden Years of Disney Master Classes, Volume 1: The Walt Stanchfield Lectures and Drawn to Life: 20 Golden Years of Disney Master Classes, Volume 2: The Walt Stanchfield Lectures edited by Don Hahn. What a sabbatical Don is having! Writting a great book, editing a series of truly exciting books and preparing a documentary about Joe Grant. 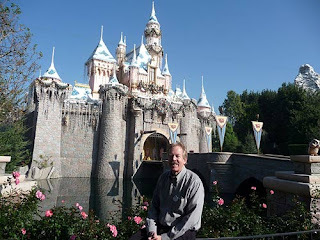 We always knew that Don was part of the "good guys" but the fact that he is spending his time away from the Studio tackling so many projects that help preserve Disney history and get people excited about animation is one more clear proof of this if we ever needed one. We are getting close to Xmas and I thought you would enjoy this item from a 1949 issue of the magazine Rexall that Jeff Kurtti sent me a while back. 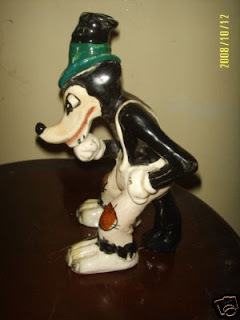 A few years ago I had the opportunity to write a detailed article about the Mexican Disney figurines from Cuernavaca for Tomart's Disneyana Update. I listed all the items I knew at the time. 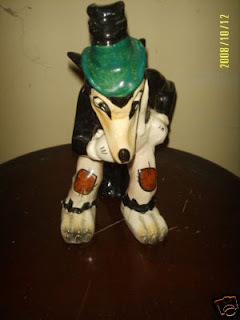 Those did not include this Big Bad Wolf that I discovered on ebay a few days ago. 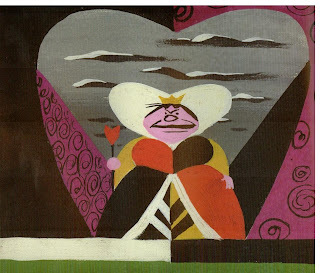 An other great concept drawing by Mary Blair being sold at the moment by Van Eaton Galleries for your enjoyment. I am still catching up with a million things. More soon this week. 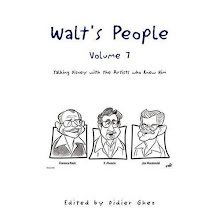 Walt's People - Volume 7 is now available on Amazon.com. 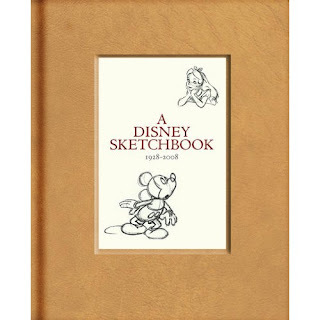 The Art of Disney Stamps limited edtion book. The Postal Service is introducing a new limited-edition book. 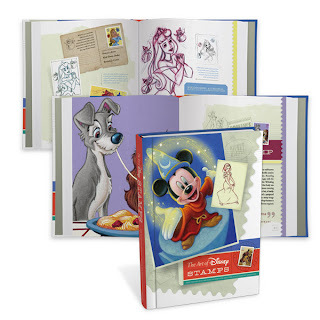 Also included in the Art of Disney Stamps hardback book are all 21 Disney-themed stamps, including an original Walt Disney stamp issued in 1968. 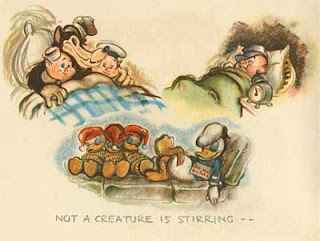 The Art of Disney, Friendship (2004) depicts Goofy and Donald Duck; Bambi and Thumper; Mufasa and Simba (from the “Lion King”); and, Pinocchio and Jiminy Cricket. Art of Disney: Celebration (2005) features Snow White and Dopey; Alice and the Mad Hatter; Mickey and Pluto; and, Ariel and Flounder (from “The Little Mermaid”). 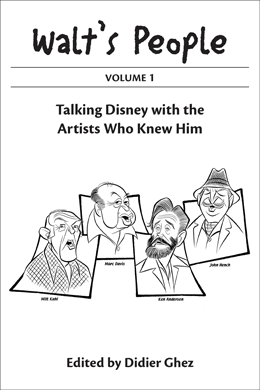 The Art of Disney: Romance series (2006) includes Cinderella and Prince Charming; Beauty and the Beast; Lady and the Tramp; and, Mickey and Minnie Mouse. The Art of Disney: Magic (2007) has Mickey Mouse as the Sorcerer’s Apprentice; Peter Pan and Tinker Bell; Aladdin and the Genie (from “Aladdin”); and, Dumbo and Timothy Mouse. The Art of Disney: Imagination (2008) set celebrated Pongo and Pepper (from “101 Dalmatians”); Princess Aurora, Flora, Fauna and Merryweather (from “Sleeping Beauty”); Steamboat Willie; and, Mowgli and Baloo (from “The Jungle Book”). 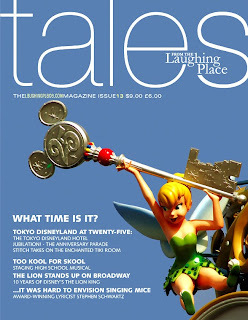 The new issue of the magazine Tales from the Laughing Place (13) is out and I must admit that I am particularly looking forward to read Rhett Wickham's interview of Ruben Procopio, titled Family Ties. 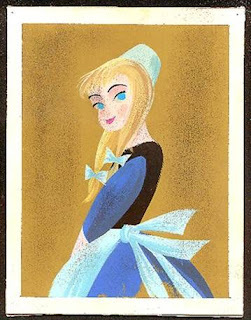 Outstanding Mary Blair concept art being sold these days by Van Eaton Galleries. We are back from India. Frankly, although we were extremely far from Mumbay, it wasn't the most relaxing trip we ever spent. I had never been to India (my wife Rita had 12 years ago) and I found the experience overwhelming. Beautiful - often stunning - temples and palaces, fascinating from a cultural perspective but way too cahotic from my point of view. I thought that Latin America and Mozambique had prepared me for environments that are not as structured as Europe, but they had not. Don't get me wrong: I do not regret the trip but it was by far the toughest vacation we have experienced to this day. The next one will have to take place in a very relaxing setting. See you all around December 10. 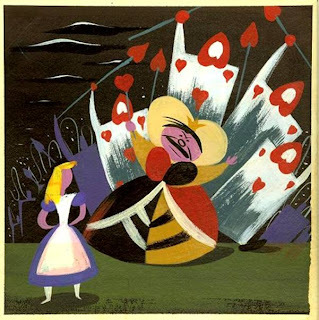 Reviewing the new Alice in Wonderland book illustrated by Mary Blair is a no-brainer. It is obviously too short like the Cinderella book in the same series. One would have hoped for something along the lines of the Alice's Adventures in Wonderland book edited by Brian Sibley and illustrated by David Hall. That being said, aside from this obvious drawback, the book is everything that one could hope for: a beautiful way to discover some beautiful Blair concept paintings (granted: a few had already been featured in Canemaker's book about Blair) and to share them with your kids. I can't wait to get the Peter Pan volume that should be released next year. Do not forget to check the new Life Magazine photo archive repository. 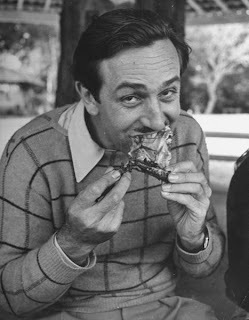 The photos of Walt it contains are outstanding and the parts about the 1941 to Latin America (which Disney and More will feature in an article later today) are simply unbelievable. I will update the blog tomorrow (with a review of Alice in Wonderland illustrated by Mary Blair), but as a heads-up: I will be on vacations starting this Friday and until December 7 (we are going to Rajasthan and if one of you lives in Delhi, please let me know). The blog will probably only be updated again starting on December 10th. 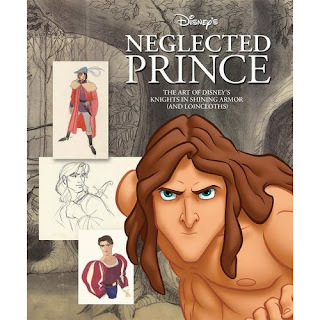 Amazon has just released updated covers for two upcoming books: The Disney Sketchbook 1928 - 2008 and Disney's Neglected Prince: The Art of Disney's Knights in Shining Armor (and Loincloths).